The first thing you notice when you walk into the candy and confection area of the Harry & David tour is the smell: The sweet aroma of chocolate. One of the first things that Kay Armstrong, tour director tells groups of people touring the Harry & David plant in Medford is that inside the building, calories don’t count. All it takes is some sniff of the incredible confections to become a believer. The company, which has been in business since 1934, offers tours of its 55-acre campus three times a day for a small fee, which you can then use as a coupon for purchasing some of their delicious products. 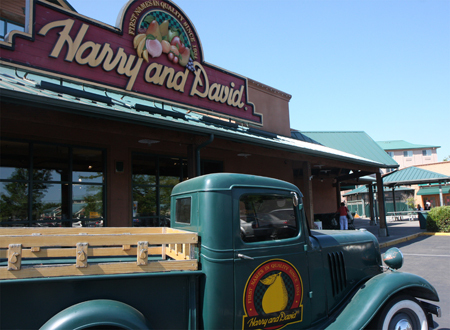 Tours start at their Harry & David Country Village, a few blocks away from the main campus – so make sure to visit the store if you want a tour as they don’t start at the factory along Highway 99. The Medford store is the company’s flagship store and it is filled with fresh pears and many aisles of Harry & David products. Visitors are loaded into small buses and then taken to the several building campus, where you can see all phases of the production. The tour, which takes about 60 minutes, is filled with facts and figures about the company. In 2009 they used six million pounds of chocolate, they make batches of 100 pounds of popcorn at a time, and cook 800 pounds per hour, they recycle 92 percent of their waste, California has the most Harry & David stores and Christmas is their largest holiday, with Mother’s Day coming in second. Harry & David is the largest employer in the Rogue River Valley, and many of their employees stay with the company for decades. As the tour began, we met Margaret, who has been with the company for 30 years and has spent many of those years tying bows for the company’s many gift baskets. In fact the employees you do meet still have that family-business attitude, even though the company was sold in 2005 and is now owned by investors. The Rosenberg family has been growing and selling pears in some sort or another since 1910, and Harry & David was created during a time much like the recession of 2008-2010. It was the Great Depression that lead to the two brothers to sell their pears by mail, and the business model was born. However, they have not abandoned their agricultural roots, with the orchard division of the company, called Bear Creek Orchards, still maintaining over 2,500 acres of pears and peaches. Royal Riviera Pears grown in the Rogue River Valley, soon became chocolate, fruitcakes and even Moose Munch. Today it is one of the country’s oldest mail-order companies. Walking over the catwalks and walkways of the tour, you get a sense of just how much business the company does – with forklifts and production lines always moving and busy. About the Harry & David: A long-time Medford and Rogue River Valley business that not only grows pears and peaches, but is one of the largest United States mail order companies. Started in 1934 as a catalogue company, Harry & David now has stores around the U.S. and offers a tour of their facilities. What to bring: The tour is about 60 minutes long, and during that time you are walking and standing. There are benches and elevators for people who need assistance. Most of the tour is indoors, but you will be transferring from a bus into the buildings, so weather appropriate clothing is suggested. Cameras are also allowed on the tour. Tip: While you can see much of what is going on during the summer, if you get a chance to take the tour in the late Fall you can really see what ramped-up production is like inside the plant. The company does 60-percent of its business during Christmas, so that’s when things are really moving. In addition, if you want to see how the company sorts and packages it’s pears, late August and October are the two times to visit. During the summer months tours do fill up, so Armstrong strongly suggested that people call ahead to reserve a spot on the tour bus. Season: Tours are offered year-round. For more information about times and availability call 1-877-322-8000 to make your reservation. Getting there: Tours start and finish at Harry & David Country Village, 1314 Center Dr., Medford, Oregon. Take I-5 to Exit 27, or Hwy 99 to Stewart Ave.